Ammonites are the extinct relatives of sea creatures such as the modern Nautilus from Palau. Ammonites lived during the periods of Earth history known as the Jurassic and Cretaceous. Together, these represent a time interval of about 140 million years. The Jurassic Period began about 201 million years ago, and the Cretaceous ended about 66 million years ago. The ammonites became extinct at the end of the Cretaceous Period, at roughly the same time as the dinosaurs disappeared. However, we know a lot about them because they are commonly found as fossils, formed when the remains or traces of the animal became buried sediment that later solidified into rock. An artist's impression of a simplified cross-section through a ‘living‘ ammonite. Ammonites were marine animals belonging to the phylum Mollusca and the class Cephalopoda. They had a coiled external shell similar to that of the modern nautilus. In other living cephalopods, e.g. octopus, squid and cuttlefish, the shells are small and internal, or absent. The ammonite's shell was divided into chambers separated by walls known as septa (singular septum). These strengthened the shell and stopped it from being crushed by the external water pressure. Ammonites could probably not withstand depths of more than 100 metres. The septa had frilled edges: intricate lines, of varying complexity and known as sutures, mark where the septa joined the shell wall. The ammonite lived in only the last chamber, the body-chamber; earlier ones were filled with gas or fluid which the ammonite was able to regulate in order to control its buoyancy and movement, much like a submarine. Ammonite suture. The septa of an ammonite had frilled edges: intricate lines, of varying complexity, known as sutures, mark where the septa joined the shell wall. The most important functions of the ammonite shell were protection and flotation. Each complete 360° coil is called a whorl. Except for the inner-most whorl, the shell is made up of three layers. The thin innermost and outermost layers are composed of prisms of aragonite (a form of calcium carbonate). The thicker middle layer is nacreous (mother-of-pearl), formed of tiny tabular crystals of aragonite. In scientific literature, it has been the convention to illustrate ammonites with their body-chambers at the top. This is the opposite of their position in life. Ribs, spines and tubercles (knobs), which frequently adorn the shell, may have strengthened it, but they may also have provided physical protection and camouflage against various predators, including marine reptiles (such as ichthyosaurs), crustaceans, fish and other ammonites. They also helped to regulate buoyancy and stability, as well as being sexual display features. Ammonites probably fed on small plankton, or vegetation growing on the sea floor. They may also have eaten slow-moving animals that lived on the sea bottom, such as foraminifera, ostracods, small crustaceans, young brachiopods, corals and bryozoa, as well as drifting, slow-swimming or dead sea creatures. As with living animals, ammonites are classified into species and genera whose names must be Latin words or words that have been latinised. The proper scientific name of a particular ammonite consists of the name of the species, preceded by the name of the genus to which it belongs, plus the name of the first person to describe it, and the date. Some genera of ammonites had shells that were coiled in more bizarre ways. These are known as heteromorphs, from the Greek heteros meaning different and morphe meaning form or shape. The coiled shell is generally the only part of the ammonite to be preserved as a fossil. The coiled shell is generally the only part of the ammonite to be preserved as a fossil. As well as being aesthetically pleasing and popular with fossil collectors, they are of particular value to geologists. The use of ammonites in stratigraphy was pioneered in the 1850s by two Germans — Friedrich Quenstedt of Tübingen (1809–1889) and his one-time pupil, Albert Oppel of Munich (1831–1865). Their work was based on the ammonites of the Swabian and Franconian Alb of southern Germany — the eastern extension of the Jura Mountains of France and Switzerland, from which the Jurassic Period takes its name. The rapidity of ammonite evolution is the single most important reason for their superiority over other fossils for the purposes of correlation. Such correlation can be on a worldwide scale. Ammonites can be used to distinguish intervals of geological time of less than 200 000 years duration. In terms of Earth history, this is very precise. Map showing the main areas of Jurassic rocks (coloured blue) and Cretaceous rocks (coloured green) in Britain. The foreshore and cliffs at Lyme Regis and Whitby are famous collecting localities for ammonites and other fossils. Ammonite fossils are traditionally illustrated 'upside down' with the body chamber shown at the top. However, in life they would have swam the other way up, as shown in the gallery of artist's impressions above. The geologist must be wary of the condition known as homeomorphy. This is when a particular shell form or morphology is repeated, so that unrelated genera or species of different ages are nearly identical in appearance. Note the similarity between the Mid Jurassic Kosmoceras and the Early Cretaceous Euhoplites. Asteroceras obtusum (J Sowerby, 1817). The Jurassic ammonite genus Kosmoceras, showing ribs, spines and tubercles. Ammonites take their name from the Egyptian god Amun, known to the Greeks as Zeus Ammon. Ammonites take their name from the Egyptian god Amun, known to the Greeks as Zeus Ammon. This god is depicted on Cyrean coins and in sculpture by a head with curling ram's horns. Many genera of ammonites have names ending in -ceras from the Greek word 'keras' meaning horn. An artist's impression of the Egyptian god Amun. Hildoceras (named after St Hilda) as a snakestone. Early works of natural history compared the coiled form of the ammonite with that of a serpent, and ammonites became widely known as snakestones. In order to perpetuate the legend that ammonites were serpents that had been turned into stone, local collectors and dealers in fossils frequently carved heads on them. Whitby coat-of-arms (courtesy of Whitby Town Council). The legend is particularly associated with the town of Whitby in North Yorkshire, the home of the Anglo-Saxon abbess St Hilda (614-680 AD). The town's coat-of-arms includes three 'snakestones'. Used as charms, ammonites were thought to be a protection against serpents, and a cure for baldness and infertility. Part of colour-tinted lithograph cartoon showing an impression of life in the Early Jurassic seas drawn by Henry de la Beche (1796–1855), the first Director of the British Geological Survey. An ammonite-like creature is shown far right. Nannocardioceras — no bigger than a thumbnail. 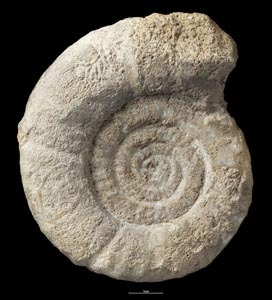 Ammonites show an enormous range in size from the very small, like the Late Jurassic Nannocardioceras (in which complete adults are rarely more than 20 millimetres in diameter). Parapuzosia seppenradensis — standing taller than a human. This 1.95 metres diameter Parapuzosia seppenradensis is from the Late Cretaceous. It was found in Germany in 1895. If complete, this specimen would have had a diameter of about 2.55 metres. Click here to view this fossil as a 3D model. Many of the fossils in the BGS palaeontology collections are available to view and download as 3D models. Click on the caption to view this ammonite as a 3D model or go to the GB3D Type Fossils website for further information.